I remember watching re-run episodes of The Lone Ranger on cable as a kid. I loved the way that no matter what the situation that justice would prevail because of the work of the Lone Ranger and Tonto. Fast-forward to summer 2013. I felt like a kid again as I watched Disney’s movie The Lone Ranger this past weekend. I have to say this is the most entertaining movie I have seen in a long time. There was so much action, suspense, laughter, and GREAT STUNTS that I do not know how they fit is all into 149 minutes. 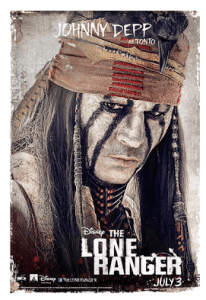 The story is well presented and chronicles how the bookish John Reid, played by Armie Hammer, becomes the Lone Ranger and befriends a fearless and unstable Indian named Tonto, played by Johnny Depp. Armie Hammer’s performance was fantastic. Helena Bonham Carter as Madame Red also delivered a great role. But Johnny Depp stole the show with his portrayal of Tonto as I had expected. I would definitely watch this movie again. If you are looking for probably the best summer blockbuster movie, look no further. Make plans now for 3 JULY 2013, to go see this movie. If you liked my The Lone Ranger Review, make sure to check out my other Reviews!